WASHINGTON COUNTY — Washington County residents awoke to sirens Saturday morning as police officers, sheriff’s deputies, troopers, rangers and other first responders from all over the county escorted 100 lucky kids to three different Wal-Mart stores to go Christmas shopping for the annual Shop with a Cop. 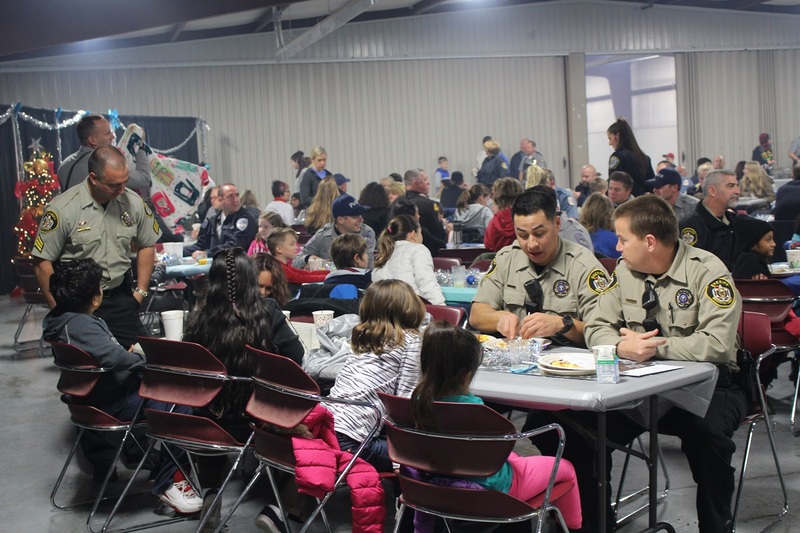 The morning started for some at the Hurricane Community Center where kids and cops convened to travel to the Washington County Regional Park, or fairgrounds. All enjoyed an early breakfast for the kids thanks to a group of officers and the like who awoke early to cook, along with those assigned to accompany the kids. Washington County Sheriff Cory Pulsipher fulfilled his now-familiar role of serving up hotcakes and eggs to the crowd. 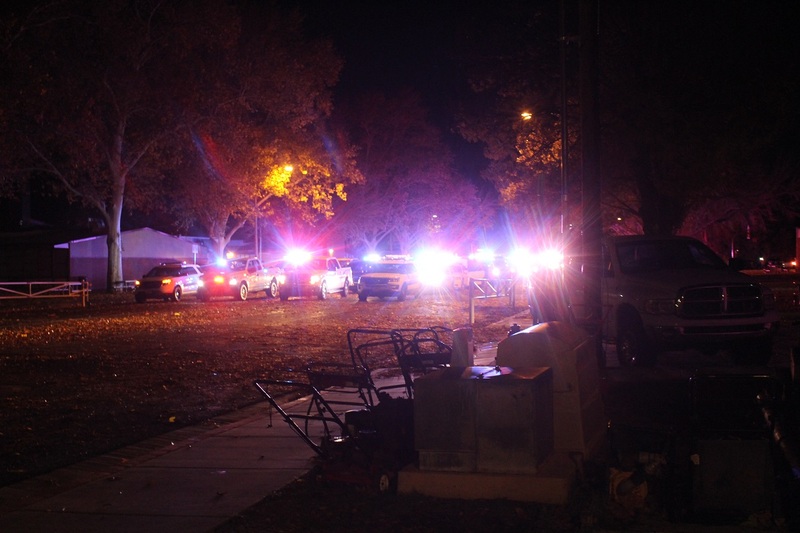 It was an early morning for the kitchen crew, who arrived at approximately 3:30 a.m. to start cooking for more than 300 officers, children and administrative staff who arrived to help out, St. George Police Department’s public information officer, Lona Trombley said. In years past, breakfast was served at the Elks Lodge, but now that the program has become too big, Pulsipher took it upon himself to get everyone fed. Food was donated by Sysco Food this year, he said, and volunteers came together to serve, cook and make sure everything ran smoothly. Once breakfast was finished, the kids rode shotgun as more than 100 police vehicles left the Washington County Fairgrounds with a show that many will remember long after the holiday. The ride was full lights and sirens the entire way, as the children made their way to the stores with their assigned officers. In years past, the group arriving at the Hurricane Wal-Mart have seen a helicopter flying overhead, but due to the high winds this year, Santa arrived on Hurricane Fire District’s Ladder 42 in style, Hurricane Police Officer Jeff Adams said. Each child was allowed $150 to spend on whatever they like, whether toys for themselves or presents for their families. The program is supported by many different law enforcement agencies around the county. “The county attorney is here, county commissioners are here, some of the heads of agencies from even some of our federal partners, the FBI, and we’ve got officers from across the entire county: highway patrol, state parks, all the police departments,” Pulsipher said. LaVerkin Police Department was represented by Officer Amber Crouse, who said it was her 10th year participating in the event. She shopped with little Toni Salazar, who was looking for toys, clothing and gum. “We do this because it’s good for the kids, and it’s fun,” Crouse said. 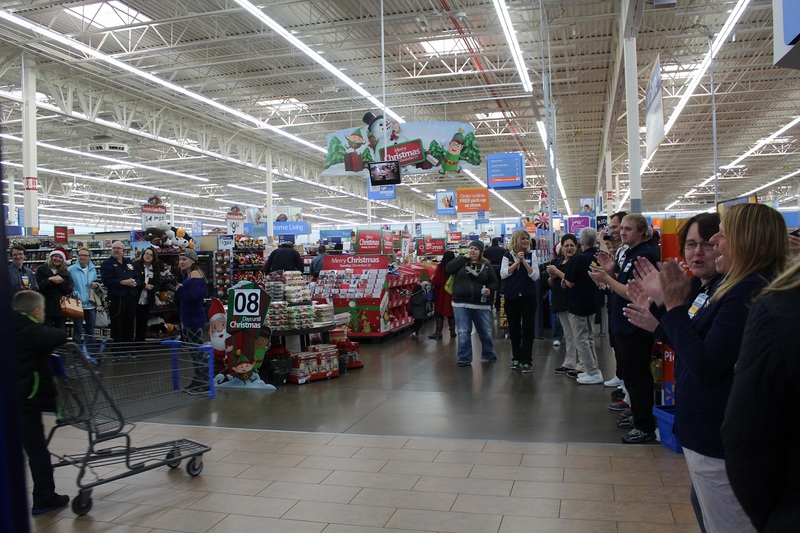 At the Bloomington Wal-mart, children and officers could be seen in every toy isle, including St. George Police Lt. Jeff Bahlmann, a 10-year veteran of Shop with a Cop who has 17 years on the force. Bahlmann also brings his three children to help out every year, he said, because it teaches them to think of others during the holidays, and it’s something their family loves to do. Shopping with the children is something Paul Dolgner of the Washington County Sheriffs Office has done for several years. The experience became particularly important once Dolgner had children of his own. It’s an annual event that he looks forward to, and it builds a positive relationship with the kids, he said. The children who participate in the event are from families in need and are chosen by the “KONY Coins for Kids” program. The officers involved all said how grateful they are for the opportunity to work with the program. Wal-Mart plays a big role in the event as well, and according to assistant manager, Stacey Brown, the reason is simple. While shopping, both the kids and the officers were all smiles as they share in the holiday spirit. “It’s a great program, and we love doing it,” St. George Police Officer Jeremy Needles said. Many agencies were represented at Saturday’s event including St. George Police Department, Washington County Sheriffs Office, LaVerkin Police Department, Hurricane Police Department, Washington City Police Department, Utah Highway Patrol, Utah State Parks, the FBI, Washington County Commissioners, Springdale/Zion Canyon Department of Public Safety and Homeland Security.